Small to midsize businesses face many challenges, the biggest of which is usually managing growth. A business that grows faster than expected may be hindered by operational constraints, such as a lack of staff, workspace and network infrastructure. According to Deloitte, businesses that have moved to the cloud have grown 26% faster and deliver 21% higher gross profit. Of all the companies surveyed, 85% said that the cloud had enabled their business to scale and grow faster. In essence, more and more businesses are realising the benefits of the cloud and have grown faster and reaped more profits through cloud-based technologies. One fundamental cloud-based solution that all SMB businesses should consider implementing is an enterprise resource planning (ERP) system. Having this all-in-one business management software tool will allow for departments to access data in real-time through one system. An ERP is a critical backbone for any company with benefits immediate benefits including increased efficiency, streamlined processes, better visibility and transparency of corporate data and much more. If you are considering moving your ERP system to the cloud, have outgrown your accounting system and/or want to transition to a cloud-based environment, here are 4 ways your business will run faster with Cloud ERP. By using cloud computing, your growing business won’t have to purchase, install and maintain server equipment which can be tedious and time-consuming. The cloud provider will take care of all security and maintenance, saving time to allow you to focus on what your company does best. The speed of cloud scalability means that you can quickly evolve your IT infrastructure to be as powerful and expansive as you need it to be the minute an opportunity for growth presents itself. You can scale up immediately and get to work faster as your business increases its headcount and volume of data. 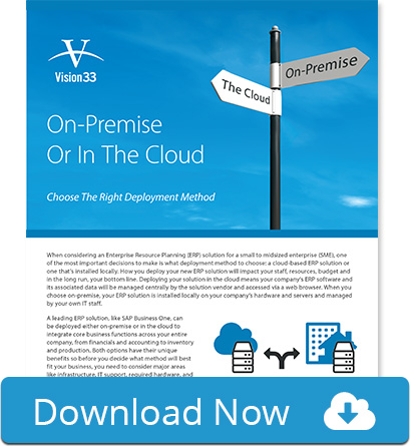 Read more about cloud ERP scalability and flexibility here. No matter what industry you’re in, the market demands fast service, product and service reliability and transaction predictability; crucial factors that can put your business into a disarray if not handled properly. Moving to the cloud allows you to push products to the market much quicker. These are just a few reasons why your business will run faster with Cloud ERP. There are plenty of other reasons why a Cloud-based ERP is beneficial for growing businesses in the long run including cost and security.